Junior League partners with Marie Detty Parker Pointe Girls Home, a 16-bed, foster care group facility for young women whose emotional or behavioral needs cannot be met in traditional foster care. Many of these young women have a difficult time coping with relationships due to past neglect and abuse. Junior League provides an outlet for these young ladies through physical activity, basic cooking skills, and self-care treatments like our “spa days.” Our members focus on modeling healthy relationships and developing connections with the girls. As some come from unstable backgrounds, our members offer tutoring services when a young lady requests it. Our members have tutored on fractions, edited papers and provided avenues for confidence through academia. 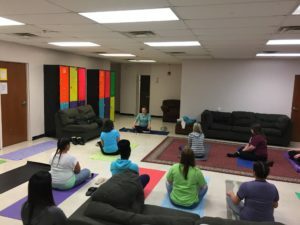 Dragonfly Yoga instructor and Junior League member Holly Guglielmo leads Parker Pointe girls through controlled breathing exercises.